"Where is Temple Terrace?" This is a frequent question in my world. Recently an out of town friend asked if I lived in Tampa. My response was, “is that a trick question?” On the northeast side of Tampa, you’ll find the relatively small but busy community of “The Terrace.” There are so many things to do in Temple Terrace, especially places to eat – there’s something for everyone. Take Stefano Greek Italian Restaurant for instance. Seems like it’s been on 56th Street for as long as I can remember, but actually only opened in 1994. It did move locations several years ago when the strip mall it had been in for so long remodeled. It’s somewhat small, and sometimes every parking space is taken. But if you have the time to wait for a table, you will get some of the best food in Temple Terrace. Stefano's specialties are always amazing, in particular the moussaka. Usually it takes me three meals to finish the generous portion, and their tzatziki has the best flavor. Unfortunately, Stefano's is not open “seven days a week” as their sign, website and Facebook all say – they’ve been closed on Sunday now for months and everyone is tight-lipped about why or if they’ll ever reopen on Sunday again. It’s a shame because it was a great place to go have brunch for a great price, with delicious food and close to any Temple Terrace home. But the other six days of the week you can definitely get your fill and have leftovers! Another Temple Terrace restaurant you can't miss is Ruben's Cubans or as it’s known now - Ruben's Cuban Cafe. Twenty-nine years ago when it opened, Ruben’s was just a great place to go grab a Cuban for lunch. But now they’ve expanded to a full-service restaurant, with excellent breakfast sandwiches on Cuban bread, soft serve ice cream, and amazing dinners that rival any Tampa restaurant. Ruben’s does close at 8pm and is also not open on Sundays. Grab yourself a punch card for the sandwiches too and after nine punches, your tenth one is free! Takeout is also available at Ruben's Cuban Cafe. Heading east for something to do in Temple Terrace, you’ll find Shamrock's Ale House. This is one of the newer Temple Terrace places to go, having been around a little less than a decade. Shamrock’s is both sports bar, with 15 big screen TV’s to watch all your favorite sporting events, but also family friendly with a large menu of options for you and the kiddies. As an added bonus, Shamrock's serves breakfast from 8am-11am, and there's a special every day. Temple Terrace even has its very own nightlife spot – Gaspar's Patio Bar & Grille. The original building was part very tiny liquor store and bar, originally called the TTL (as in Temple Terrace Liquor). Named for the original owner, Gaspar’s grew into a great place to watch Sunday sports, have a drink with friends, and if it’s your thing – sing karaoke! As the bar has grown and remodeled, first came the fantastic patio area which also has plenty of tv’s and sometimes live music. Next they bought the empty building next door, and it has become a pool room and a brand new larger liquor “shoppe.” Their nachos are huge and shareable, but my favorite thing are the oysters; at a reasonable price, Gaspar’s serves you a dozen large fresh oysters with all the cocktail sauce and horseradish your heart desires. Of course the size does depend on the time of year, but if you’re an oyster person – this is the place to get them. The bar has a huge liquor and craft beer menu, as well. Smack dab in the middle of Temple Terrace is Vallarta's MexicanRestaurant. One of the many thriving independent restaurants in Temple Terrace, Vallarta's now has several locations throughout the area, but the Temple Terrace Vallarta's is the original location. Family owned and operated since 1992, Vallarta's offers daily specials, coupons, and 2-for-1 margaritas every day from 2-7pm. Adding to its authentic charm, sometimes you find yourself serenaded by a mariachi band while enjoying your fajitas and sangria! Vallarta's Mexican Restaurant is the real deal. The University of South Florida is right the edge of Temple Terrace, and many students live, work and play in city limits. Gators Dockside, a Florida based chain, is a great place for students to both hang out or get a job. A family-friendly sports bar, with so many big screens on which to watch Bucs and USF football, Gator’s has a huge menu that includes fried Gator Tail, Monday-Friday lunch menu, AND gluten-free options. Gators Dockside wings are a big favorite with 24 different sauces ranging from sweet to “4 Alarm Suicide”; you can even get PB&J flavor! Come to the Temple Terrace location (i.e. North Tampa) for all-you-can-eat wing nights on Monday AND Wednesday! 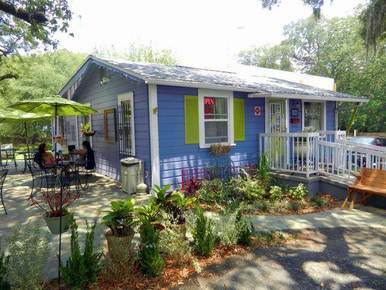 Hidden away just off Fowler Avenue in a little unassuming cottage is Felicitous Coffee House. Founded by a former USF student who wanted somewhere off-campus to be able to go study or chat with friends, this little shop has courtesy WiFi and an array of delicious beverages for you to choose from. They even welcome your pet on their patio area. One of the definitions of felicitous is “pleasing and fortunate;” it seems they have chosen the right name for this hidden gem. Next door to Felicitous is the legendary CDB's Pizza & Italian Restaurant. The ambiance of an Italian family restaurant remains with its red seat cushions and perfect lighting, but don't bring your diet here as the CDB’s menu has so many delicious items you may have to try a little of everything. Appetizers are affordable and delicious with options such as fried green tomatoes and fried ravioli, and dinners are plenty of food to share or take home for leftovers. The stuffed shells come with four large stuffed shells, baked with plenty of sauce and cheese and for only $12.99. If you just want to hang out and have a drink with a friend or watch that day’s game, CDB’s also has a small bar to the left as you walk in with several high top tables. There are several chain restaurants in Temple Terrace too if that's what floats your boat, but if you want to find some hidden treasure just outside the Tampa city limits, head towards "The Terrace." You'll find these and more reasons to come back! Looking for more events in Temple Terrace, or other things to do in Tampa Bay? Stay here at 813area, and be sure to register; it's free! Picture courtesy Felicitous Coffee House.